Within minutes you and your sales team can produce professional proposals that will outclass and outshine your competition. Now with style sheets, you can choose the look that is right for you - Classic, Modern, or a simple straightward look. Pursuit is not your ordinary quote system - it is a powerful sales tool that coordinates your sales efforts and puts more time back into your busy schedule. If you are taking more than 5 minutes to create a proposal, then you are taking 4 minutes too long. Once you have Pursuit setup with your company requirements and inventory (which is shared within the Alarm database), proposals can be created by a sales person within a minute. Pursuit also shares vital data with our Alarm software, producing purchase orders, service tickets and invoices directly from your proposal. 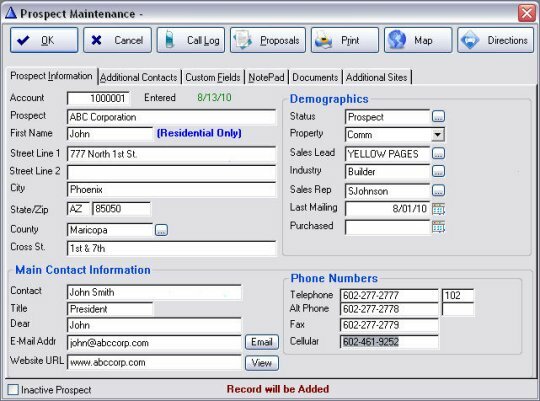 When integrated, they provide a powerful CRM system for your entire company. Pursuit will wow your prospects and leave your competition far behind. Pursuit 7 is a powerful sales tool that coordinates your sales efforts and puts more time back into your busy schedule. With the included ProSync feature, each salesrep can have Pursuit 7 installed on their own laptop and generate proposals while out in the field. 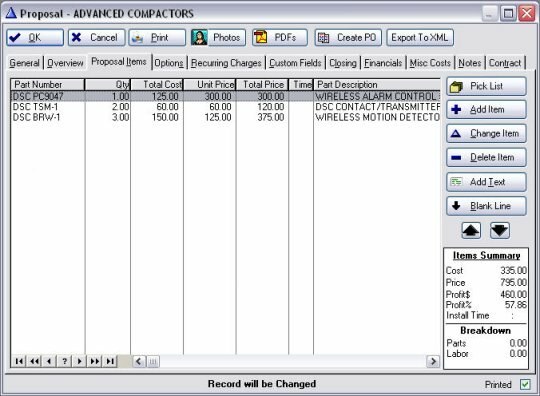 Then remotely merge their proposals and contacts into the master Proposal database back in your office. True mobility for your sales team while maintaining one cohesive proposal database for management. ProSync Replicator provides powerful synchronizing between individual computers and laptops used by your sales team out in the field. Synchronize over your local area network or via the internet! Attach unlimited PDF documents to each proposal. Perfect for including sales brochures, data sheets, product images, etc. for a dynamic sales presentation. Create personalized contracts with merged prospect data within seconds and include with your proposal. Perfect for attached monitoring and service contracts to your quotes. Print product photos under each item or on a separate page. Favorite Item feature shows only items marked as favorites in inventory. Pursuit 7 is sold with an unlimited license for one purchasing company, with no additional fees for network or per-user use. Pursuit uses one Alarm SQL seat per connection. Each member of your sales team can run Pursuit 7 on their laptop and later merge their proposal to your master database - remotely! Pursuit tightly integrates with Alarm, sharing similar files such as inventory, and creates invoice from proposal and service scheduling within seconds.